TB Markinson is an American writer living in England. When she isn't writing, she's traveling the world, watching sports on the telly, visiting pubs, or reading. Not necessarily in that order. Feel free to visit TB's website lesbianromancesbytbm.com to say hello. She also runs I Heart Lesfic (iheartlesfic.com), a place for authors and fans of lesfic to celebrate and chat about lesbian fiction. 4.0 out of 5 starsYou will Fall for this Girl. This intriguing sequel to The Miracle Girl had me wanting to turn off all my electrical devices and go cold turkey off social media. It highlights many of the things wrong with the internet today. Fake news is very much in the news. Another example of how the erosion of good quality journalism by newspapers shutting down and how we are relying on news from social media, which often doesn’t seem to be factual. This is a story from The Dark Web. So how does this all effect JJ, The Miracle Girl? Well just when her life is looking really good, Clare and her a happily living together, with her son and they are about to add a daughter. Work is crazy, nothing different there, as she is busy travelling around on a book tour. Their online News service is sending her all over the country too, looking for backers to constantly feed the beast. But, her past is about to once again bite her and she doesn’t know who to trust. Will this be the end of JJ, once and for all? Markinson weaves a tale of love through a murder and cyber mystery. There are twists and turns everywhere, I didn’t know who to trust. There are an array of secondary characters that are very interesting and I would love to know more about Avery. I’m sure there will be a third book in this series as there are a few questions left unanswered. Clare and JJ have great chemistry and Markinson has refreshingly written the love scenes with a new slant and with such depth, that their love leaps off the pages. Markinson’s characters always evoke a wide range of emotions, that I sometimes wish I could reach in and give them a hug. She makes you care about them, always a sign of a good writer. This story will send your moral compass into a spin. It’s one of those stories that stays with you long after you finish it and makes you question what is really important in your life. So do yourself a favour and read The Miracle Girl and The Fall Girl if you hadn’t already. Best to read The Miracle Girl first as this book foloowsbon with the same characters and a developing storyline. I didn’t read Miracle Girl first and so confusion hampered my reading. The characters are well developed In typical TB style. This book has it all and as is typical of Markinson's writing her characters are so well developed and the storyline so full of excitement it is hard to stop reading once you start. The book centers around JJ, Who is finally reunited with her one true love , Claire, who she lost 20 years ago. In that 20 year span JJ has done much that she regrets and unfortunately ended up writing a book about it after being blackmailed by her ex lover. At this point in her life the only thing JJ wants is to settle down with Claire and their two children and have a normal life. That however is not in the cards as there is much betrayal, threats of blackmail, and being talked into taking on a very dangerous and potentially lethal investigation to find a serial killer. It is amazing the amount of research that Markinson put into this book as she went into detail about the Internet and media news outlets that was quite fascinating, and cereal killers. You know when you're reading that it any moment something potential he deadly could happen and at the same time you are rooting for Claire and JJ to have the quiet life they both desire as they raise their family. There are points in the story where it appears that folks close to JJ, like the cofounder in her media business, is going to throw her under the bus because she desperately wants drama in an explosive story that would boost the ratings in their media organization. JJ constantly is on edge not knowing just who is betraying her more her ex lover or her co-partner in business. The story is amazingly well written and as is the case with all of Markinson's books, it is well edited. There is a skill and character development and plot development that makes the reader want to not put the book down once it started and with her books you can guarantee that is the case . I was given an ARC for an honest review of this book. 5.0 out of 5 starsSpectacular Series!! I swear, this series got better every book— especially considering how high the bar was set with the first one!! But, once again T.B. Markinson delivered an incredible piece of written art. A suspense that kept you in the dark, surprising you with a new twist just when you thought you'd finally figured it all out—only to discover you were wrong about everything! The spellbinding mystery intertwined with the beautiful & bristled love story of Claire & JJ established in book 1, mixed with the timely & relevant conversations about the internet, social media, cyber bullying, journalistic integrity & fake news melded perfectly that entertains, enlightens, engages & enthralls. I just wished that this wasn't the conclusion because I still need—WANT SOOO DESPERATELY—to continue following these characters' lives, endeavors, journeys & futures. You have to be kidding. I love this series and I hope a third book is on its way fast. I really liked how the characters were believable. I kept cheering JJ on saying on miracle girl. 😄. I am not sure about Cora and JJ s assistant something is going on there. The storyline of on line bullying was well done. But I keep looking at all my electric devices wondering. I definitely recommend this book. 5.0 out of 5 starsAnother great book by T. B. Markinson!!! The plot, the characters, and story line absolutely amazing. Yet, the most astounding element is the writer’s dialogues. They are natural, well done and of course they move the story forward. I loved the Miracle Girl but I double loved The Fall Girl. Hoping for another installment soon. 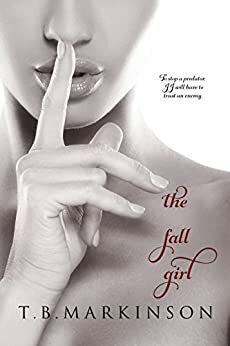 5.0 out of 5 starsThe fall girl. Entertaining book. As usual author delves into relationships with great insight. The revelation of how fake news destroys was well presented and how the internet can expose anyone was well done with this story. Couldn’t put it down towards the end of the book.